Lynda Johnson took monthly check from the District while voting against an increase in teacher salaries. During that time she also took $157,000 in benefits from her employer, the L.A. County District Attorney. A public records request under the Freedom of Information Act by Hews Media Group-Community News has revealed that current ABCUSD Board Member Lynda Johnson has taken over $7,500 in “cash in lieu” payments since her election to the ABC Board. Cash in lieu is a duplicitous way for Johnson to receive a check every month from the cash-strapped district “in lieu” of health insurance. Every year Johnson declines health insurance coverage from the ABC, then instead of giving the money back to the ABCUSD, she accepts a check for the amount of coverage. Johnson is the only board member to take cash in lieu payments since 2013. Johnson, who works for the L.A. County District Attorney’s Compton office as a paralegal, also took hefty benefits from L.A. County while taking the check from the ABCUSD. According to Transparent California, Johnson received benefits totaling $157,000 from 2011-2015. Johnson received $37,000 in 2015, $32,000 in 2014, $37,000 in 2013, $24,000 in 2012, and $27,000 in 2011. The revelation that Johnson accepted checks comes after Johnson questioned and accused ABC nutrition employees of stealing money from cafeteria purchases. “I want to hire another person to watch them count the money, and install a surveillance camera,” Johnson said at a recent meeting. Johnson is also well-known for her statements against increasing teacher salaries while voting to spend money on “shade structures” in various schools. Johnson has been very vocal the past few months, with sources telling HMG-CN that she has “never got over” the Board passing her over and nominating Maynard Law as President. 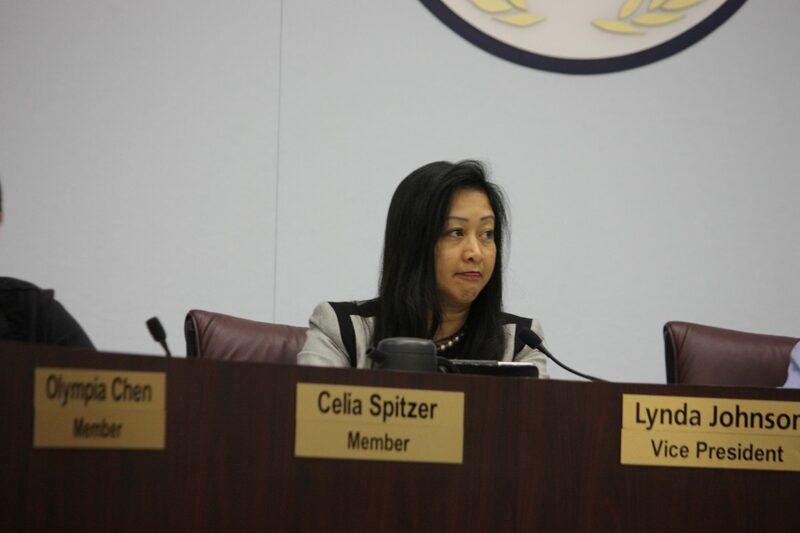 Sources told HMG-CN that Johnson’s opposition to Measure AA and her alignment with Cerritos Councilwoman Carol Chen, who also opposed Measure AA, severely hurt her chance to be President of the Board. During the next few months, Johnson was accused of using “petty tactics” and having a “vendetta” against ABC Board Members and ABCFT union employees. Johnson tried to block one long time teacher from his appointment to a voluntary committee position. After the meeting, Johnson got into a one-sided verbal confrontation with Board VP Chris Apodaca. Witnesses told HMG-CN Johnson hurled several f*** bombs at Apodaca, but Johnson countered that a union member refuted the witnesses statements. HMG-CN later contacted two union employees, Gavin Riley and Richard Hathaway who were the only ABCFT employees at the meeting. Both stated on the record that they were nowhere near the conversation and that no other union representatives were at the meeting. Then two weeks ago, HMG-CN exclusively reported that the Los Angeles District Attorney commenced an investigation of the ABCUSD for violations of the Brown Act. Recall that Johnson works for the District Attorney. Just two weeks later the investigation was dropped. HMG-CN has questioned Johnson several times, and she has not denied that she initiated the investigation. Shameful. An estimated 4 million American school children under the age of 18 are without health insurance and this school board trustee takes $7,500 because, she already has a great healthcare policy, which is paid for by tax payers. Linda John-scum, on behalf of the American school children without health insurance I hope you enjoy spending the money. It obviously means more to you than the health of our children. POT CALLING THE KETTLE BLACK CECY! …Groom and her business, ARG Industries, Inc. of Pomona, face an investors’ lawsuit arising out of a business deal gone sour. The investors are suing her for breach of contract, fraud and racketeering, among other charges. …But during the discussion, most of the board was pulled into a closed session after Groom’s remark. made an apparently racially charged remark toward fellow member Louise Dodson, who is black.